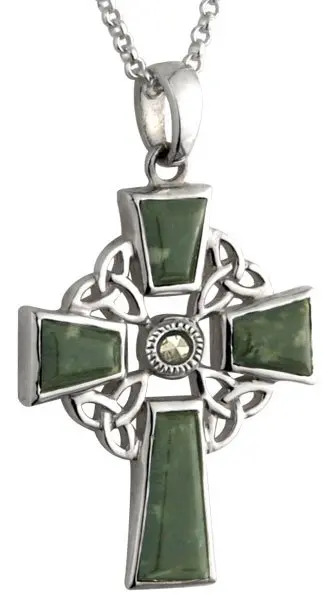 Sterling silver Connemara marble Celtic cross with trinity knot decoration and marcasite center. Handmade and hallmarked in Ireland. Beautiful marcasite center and Connemara marble panels are set into this elegant sterling silver Celtic cross. Measuring 27mm (2 inches) high (inc. bale) and 21mm wide and fitted with an 18 inch sterling silver chain this cross is handmade in Ireland and hallmarked at the Irish Assay Office In Dublin Castle.